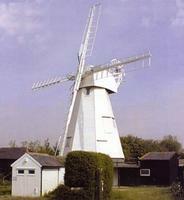 The Windmill, built around 1760, was used to grind wheat, barley and oats. In 1889 a steam engine was installed to drive the mill when there was no wind. The Granary was moved from Ham as the mill's original granary was demolished in the 1960s. It is supported on staddle stones which help to keep out rats and mice. Inside the granary are machines for sowing seeds, harvesting tools and also saddle and harness making tools used by Frederick Harle a Master Saddler who worked in Sandwich. 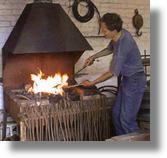 The Miller's Cottage was built about 1830 and has displays of needlecraft, food preservation and kitchen equipment. Two of the bedrooms are set out in 'turn of the century' style and there are photographs showing local people in the Victorian Period (circa 1880). There are outbuildings housing displays, in the cow shed and stable are forge and metal working tools and the wheelwright's shop has woodworking tools.